Rupert Cullen proved his mettle when he was "The Last Man Standing" in the Gutshot free-for-all at the Little Wars mini-con. 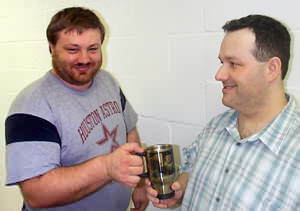 Game co-creator and GM Mike Mitchell (clean-shaven, to the right) awarded Rupert with the last Gutshot Stainless Steel Coffee Mug. 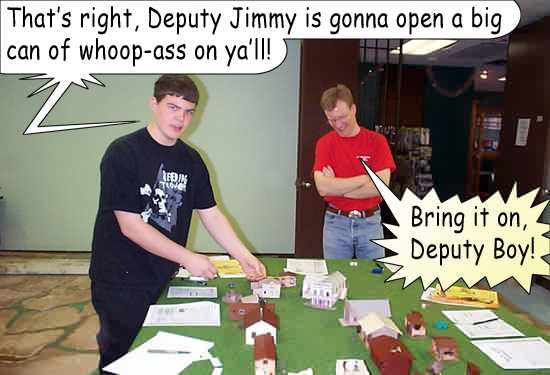 The action was fast and furious and the dice were rolling like the thunder of hooves as the gamers at Little Wars gathered to find out who would be the sole survivor of the “Last Man Standing” game at Little Wars game store during their first “Gathering of the Tribes” mini-con. One-by-one the combatants had fought, and one-by-one, they had fallen. When it came to the final two, only Tiny Roland and shotgun-wielding Jethro were standing, and each of them were wounded, almost ready to fall. As it often does – in the Wild West and still today – it came down to who drew first. And in this case, Luck was a Lady to the man from the UK -- Tiny Rowland’s name came out of the hat and Rupert Cullen rolled the dice. It was a hit and Jethro went down. Victory had been achieved! Mitchell ran the ever-popular “Last Man Standing” game, which pretty much explains the goals in the title. “Shoot everyone else and be the last one alive,” Mitchell said during the introduction to the game. As an added incentive, he also provided a prize to the winner: the last stainless steel Gutshot Coffee Mug. The item is now out of production and this is the last one remaining in stock. If the item becomes available again, Mitchell said he plans to change the design. “I think it’s really serendipitous that the last man standing got the last mug remaining,” he said with a smile. Five people joined the action on Saturday afternoon. Even as the table next door was being prepared for a Vietnam Game (run by game co-creator Mike Murphy) and down the hall the action ranged in time from WWII to Napoleonics to the American War Between the States, these five hombres strapped on their six-shooters and stepped into the Wild West. Each player ran two characters each, making for 10 figures on the board, which was set up as a small, claustrophobic town somewhere in the wild and wooly West of the late 1800s. Even before the action began, however, things started getting heated. OH YEAH, I TALK TOUGH! Michael "Don't Call Me Mister" Sandstrom measures the movement for his Character as he shoots it out with Cactus Jack. The “smack” continued to banter about the table as game unfolded and three distinct arenas formed in town. Michael and Tom Augenthaler wound up battling it out around the Sheriff’s Office at the west side of town. Rupert, Justo Perez (of the Nugamers club in Kingwood) and Brook Burg battled it out on the east side of town. The game lasted from about 2:30 - 6 p.m. Brook’s character, Lucky the gambler, proved that his name was a bit ironic as he was the first to fall, downed by Tiny Rowland (played by Rupert). The action continued (see the game report for the full story) until, at last, the last dice had rolled and Tiny Rowland made the last kill, thus earning Rupert the prize.